Doug Stauffer Ministries: Will the Church Face the Antichrist? Will the Church leave this earth prior to, during or after Daniel's Seventieth Week? Doug Stauffer vs Joe Schimmel! 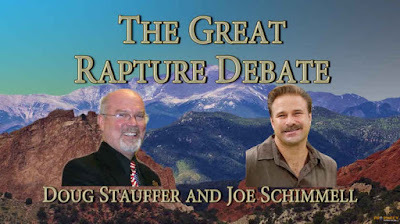 Doug will defend the pre-tribulation rapture position while Joe will defend the post-tribulation rapture position. 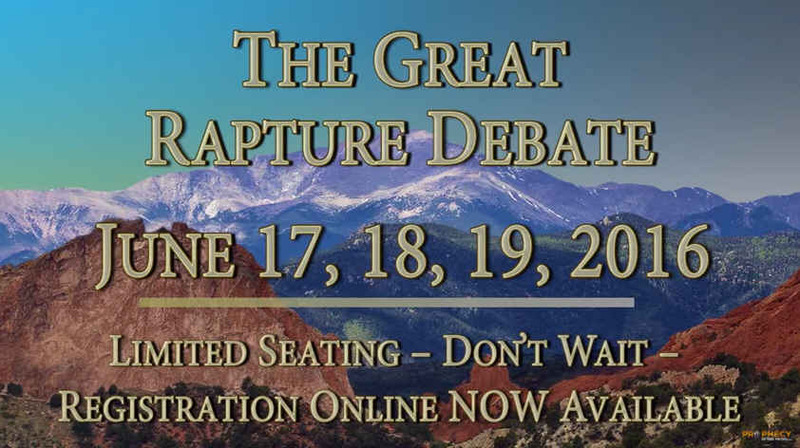 Don’t miss the 4th Annual Pikes Peak Prophecy Summit at the Colorado Springs Marriott, Colorado, June 17-19, 2016. 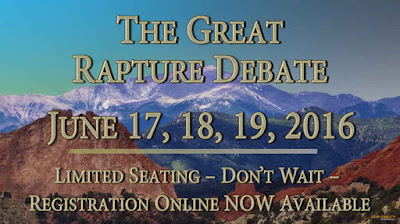 For the first time in Conference History--The Great Rapture Debate! Also includes twenty of the top speakers on Bible prophecy, including many new faces! Doug Stauffer and Joe Schimmel will partake in “The Great Rapture Debate” mediated by Douglas Woodward. Summit Speakers - Kevin Clarkson, Bob Cornuke, Billy Crone, Bill Federer, Dan Goodwin, Paul McGuire, Don Perkins, Bill Salus, Doug Stauffer, and Doug Woodward. Ben Baruch, Earl Cox, Kevin McAfee, Anthony Patch, Joe Schimmel, Michael Snyder plus several more! Limited aeating – Don’t wait!